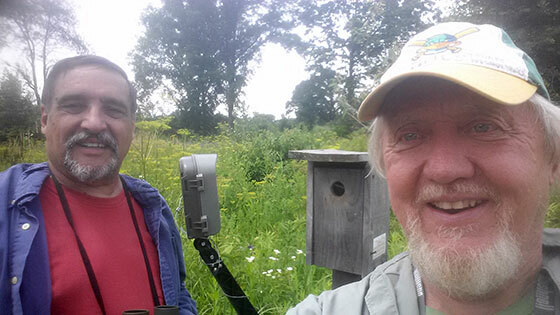 Jim Mand (left) and Paul Noeldner check a bluebird box and trail cam. Having just finished my first season as the Cherokee Marsh North Unit bluebird monitor, I’d like to reflect on what I have learned. Having first joined Friends of Cherokee Marsh in 2009, I was not actively involved. But after retiring last year on Labor Day, I was looking for opportunities to contribute. Volunteer Paul Noeldner mentioned that the group needed a bluebird monitor, and since I only live up the road from the marsh at Cherokee Condos and have had a life-long interest in birds and wildlife, it seemed like an ideal opportunity. And it gives me a chance to get out in nature and hike the trails for two hours while checking the nest boxes. So in mid-April, Paul and I walked the trails, fixed up nest boxes, labeled and marked each box, relocated one box, and installed one new box, for a total of 14. Paul gave me valuable insights into nesting materials and habits and also provided some of the tools I would need for observations and repairs. My responsibilities included checking each nest box at least once per week. During the height of the nesting season, I was out to the marsh every 4–5 days. I kept track of nest building and the number of eggs laid and chicks hatched and fledged. The nesting species included eastern bluebirds, tree swallows and house wrens. While walking the bluebird trail each time, I started to keep track of all the other birds that I observed along the way and recorded the birds identified and numbers. I set up an account with eBird (ebird.com). This helped me start a life list as I contributed data and pictures to the site. I also joined BRAW (Bluebird Recovery Association of Wisconsin), which provides a very helpful downloadable guide for monitors, and to which I sent all my data for this year’s season. I also provided updates during the season to Paul Noeldner and Jan Axelson of the Friends of Cherokee Marsh. I enjoyed going out to the marsh because it seemed there were usually new adventures waiting each time. Some highlights: Right off, on May 08, while walking out to Box 1-B in a newly burned area, I spotted a deer skeleton half buried in the ground. It included the vertebrae, ribs, and lower jaw all bleached very white. Another time I came across a fox snake on the trail by the rock outcropping near the chain-link fence. Besides the usual rabbits, squirrels and chipmunks, I also spotted a doe and her fawn just off the entrance road to the parking lot. One day while checking boxes 6 and 7, I observed a sandhill crane suddenly fly up from the middle of the prairie, carrying a snake in its beak while being chased off by half a dozen tree swallows in hot pursuit. During midseason, I started to see female turkeys along the trails. On one occasion while walking through the woods near the pond at the north end of the park, I came across several chicks on the path. Not knowing what they were, I walked up to look at them. An angry turkey charged out of the bushes to protect them as they scurried back for cover. She continued to charge me four times and backed me up at least 15 feet before she rejoined the chicks in the bushes. It was quite common to see sandhill cranes in various parts of the marsh, sometimes with young ones following them. I enjoyed listening to the adults calling back and forth. At the end of the season, while checking box 8-B, which had not been active since mid-July, I discovered that a predator (owl or hawk?) had used the top of the box as a perch while eating its prey (a smaller bird). The box was covered with tufts of feathers, and there were many clumps of feathers scattered in the tall grasses around the pole. It’s an old horizontal box, unlike the vertical ones in use now. Problems encountered: box 0, the newly installed box that is first on the trail, became infested with tiny black ants and their eggs. A female swallow had already started to lay eggs in the nest. At first, they infiltrated the bottom corner of the nest. I purchased Poultry Protector, a non-toxic spray from Farm & Fleet. It’s an all-natural solution of enzymes used for chickens and their coops to protect from mites, fleas, and ticks. The next visit, the ants had multiplied and infested the whole bottom of the next. This time I sprayed the whole bottom of the box and underneath the nest. The next visit, all the ants were gone and never came back. The tree swallow hatched all six of her eggs successfully. Predation of eggs & mortality of chicks: the biggest problem seemed to be disappearance of newly laid eggs and young chicks dying in the nest (usually after several days of high heat and humidity). Among the bluebirds, there were at least 6 eggs disappeared and 2 dead chicks. Among the tree swallows, there were at least 21 eggs disappeared and 14 dead chicks. My goal next season is to try coming up with some measures to cut down on predation by mice, snakes, raccoons, or whatever. 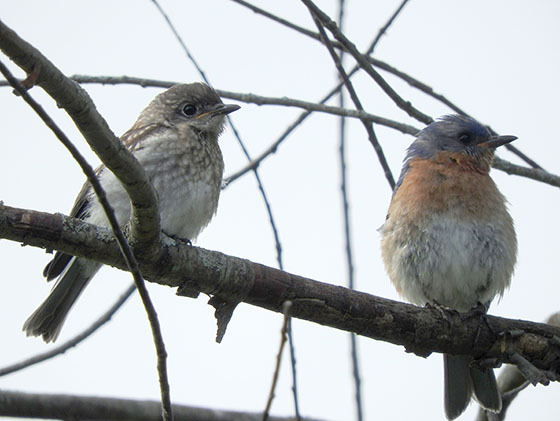 Eastern bluebirds – 25 eggs laid, 15 hatched, and 10 chicks fledged. Tree swallows – 37 fledged. House wrens – 7+ fledged. The bluebirds started nesting first, around April 20. They used up to 5 boxes. Box 10 had 2 successful nestings. The tree swallows all started nesting from May 14 to 18 They were aggressive and dominated the prairies in June and July. Then the house wrens moved in and took over 4 boxes starting on June 29 through July 13.